Chemistry: Be4Si2O7(OH)2, Beryllium Silicate Hydroxide. Uses: An ore of beryllium and as mineral specimens. Bertrandite was named after Leon Bertrand, a French mineralogist, and is one of the more important ores of beryllium, second only to beryl. Bertrandite is closely tied to the gemstone mineral beryl in many ways besides its use as an ore for the same metal. The two are often associated together as bertrandite is an alteration product of beryl. 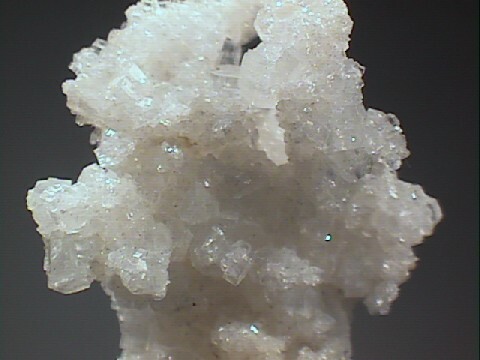 At times bertrandite is growing on beryl crystals and at other times bertrandite has completely replaced the beryl crystals forming a pseudomorph. A pseudomorph is an atom by atom replacement of one mineral for another; replacing the chemistry and structure with a new mineral, but preserving the outward shape of the original crystal. Pseudomorph mean false shape. Bertrandite is found in beryllium bearing pegmatitic rocks and some hydrothermal veins. Color is colorless, white and pale yellow. Crystal System is orthorhombic; m m 2. Crystal Habits include tabular to platy crystals and some prismatic forms. Often aggregates formed over crystals of beryl. Twinning is common. Pseudomorphs of bertrandite after beryl are also common. Cleavage good in one direction lengthwise. Fracture is uneven to conchoidal. Streak is white to gray. Other Characteristics: Some specimens have fluoresced green under UV light. Associated Minerals are numerous and include of course beryl as well as quartz, albite, orthoclase, fluorapatite, micas, anatase, brookite, pyrite, fresnoite, analcime, calcite and cheralite. Notable Occurrences include the type locality of Petit-Port and Barbin, Nantes, Loire-Atlantique, France aa well as Akca Tau and Kara-Oba, Kazakhstan; Zabytoe, Primorie, Russia; Spor Mountain and the Brush Beryllium Mine, Juab County, Utah; Harding Mine, New Mexico; Texas and Pala District, San Diego County, California, USA; China; Cornwall, England; Mongolia; Norway and Mexico. Best Field Indicators include only one direction of cleavage, crystal habit, color, association with beryl and hardness.